For the tribes of the American plains in the Buffalo Days of the pre-reservation life, horse raiding was a chance for men to show their courage and bravery in battle. No man can help another to be brave, says grandfather to fourteen-year-old Lone Bull, but through brave deeds you may become a leader one day. Lone Bull wanted to be a warrior and he knew he could be victorious in a horse raid if only given the chance But when Lone Bull's father refuses to let his son and his best friend join the raid, what do the young boys do? They set off to follow the group with the help of grandfather Will it all end in disaster? 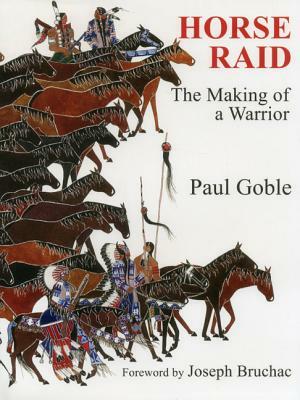 Master storyteller, Paul Goble, brings to life this exciting and timeless coming-of-age story of Lone Bull, a young Lakota boy eager to join the warriors on a horse raid against the Crow. This newly revised edition features digitally enhanced artwork, completely revised text, a brand new layout, and a fascinating foreword from world famous storyteller, Joseph Bruchac. Paul Goble is an award-winning author and illustrator of over 40 children s books. His book, The Girl Who Loved Wild Horses, won the prestigious Caldecott Medal. Born in England, he has lived in the US since 1977. In 1959, Goble was adopted into the Yakima and Sioux tribes (with the name Wakinyan Chikala, Little Thunder ) by Chief Edgar Red Cloud. Goble has given his entire collection of original illustrations to the South Dakota Art Museum in Brookings, South Dakota, where it is permanently on display. He lives with his wife in Rapid City, SD. Joseph Bruchac is best known for his work as a Native writer and storyteller, with more than 120 books and numerous awards to his credit. As a professional teller of the traditional tales of the Adirondacks and the Native peoples of the Northeastern Woodlands, Bruchac has performed widely in Europe and throughout the United States. He is the storyteller-in-residence for Native American organizations and schools throughout the US, including the Institute of Alaska Native Arts and the Onondaga Nation School. He lives in Greenfield Center, NY"